You are currently browsing the tag archive for the ‘SeaQuest Inn Bed & Breakfast’ tag. I’d like to take the time to talk about our Christmas lodging before I continue on the journey. If you are interested, click here for Day one and here for Day two. 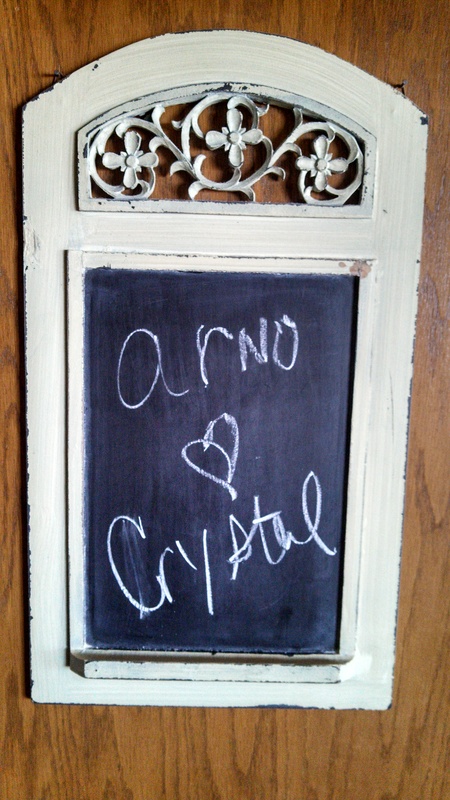 Arno found the SeaQuest Inn Bed & Breakfast online for us, and reserved three nights. 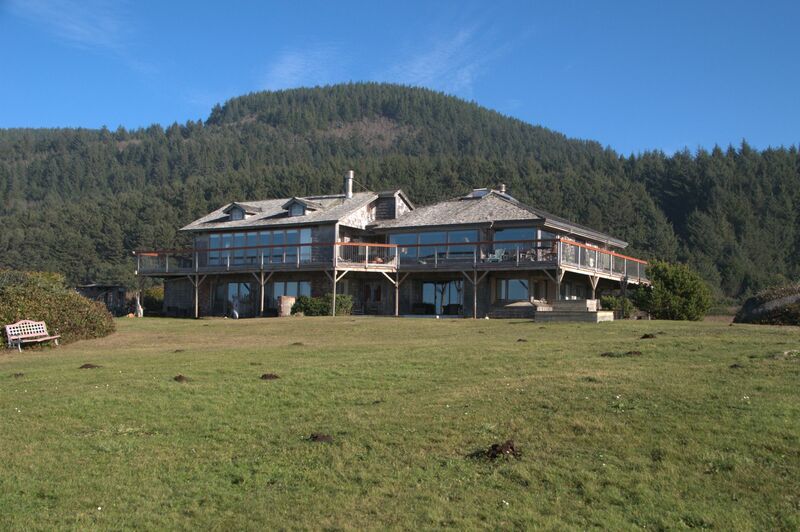 The closest town is Yachats, seven miles to the north. There are neighbors, but the location is rural and isolated, which is what we are often looking for in a vacation. It’s less than 3 1/2 hours from Portland whether you travel on I-5 or if you use Highway 18 and head out through McMinnville. Unless you’re like us, and stop at a bazillion neat sights along the way, and stretch it to two days. 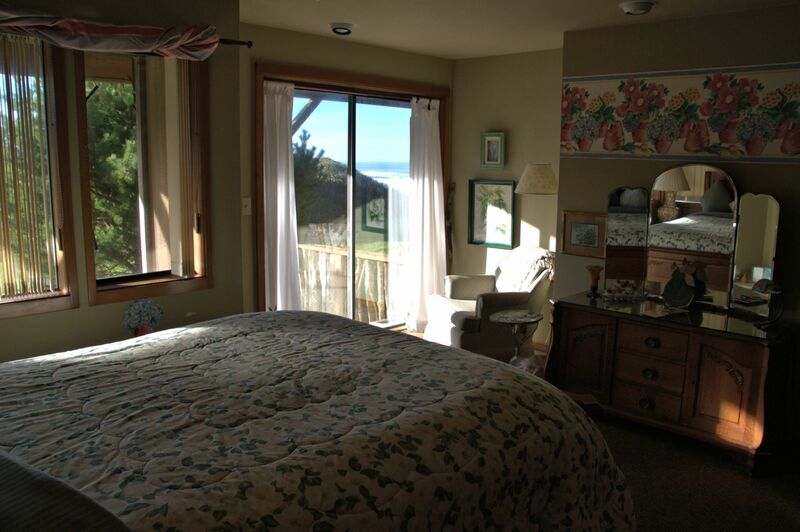 This B&B is a large, comfortable home on the beach. Our room had a sliding glass door that opened onto a patio and the lawn you see in the photo above. We literally walked to the beach from our room. 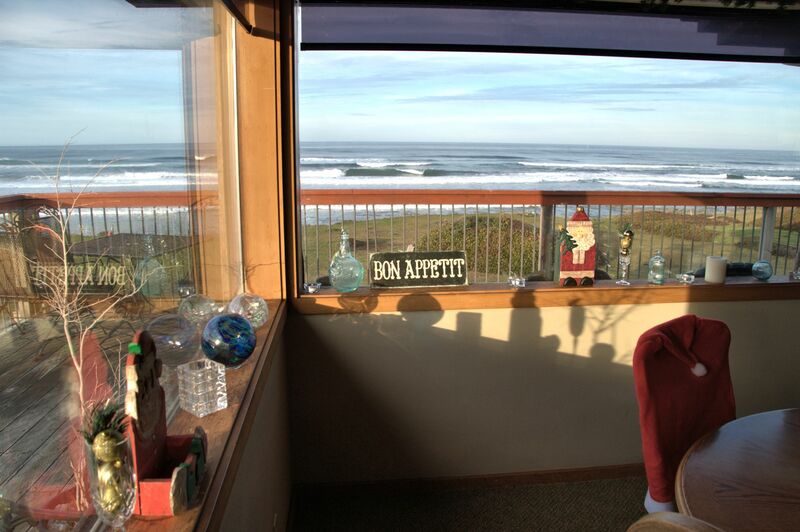 All rooms have a view of the ocean and the beds are positioned so that guests can watch the waves crash. During our stay I watched this amazing swell that made me think of surfing every single day I was there. Unfortunately, there are too many rocks to plan a future surf vacation. 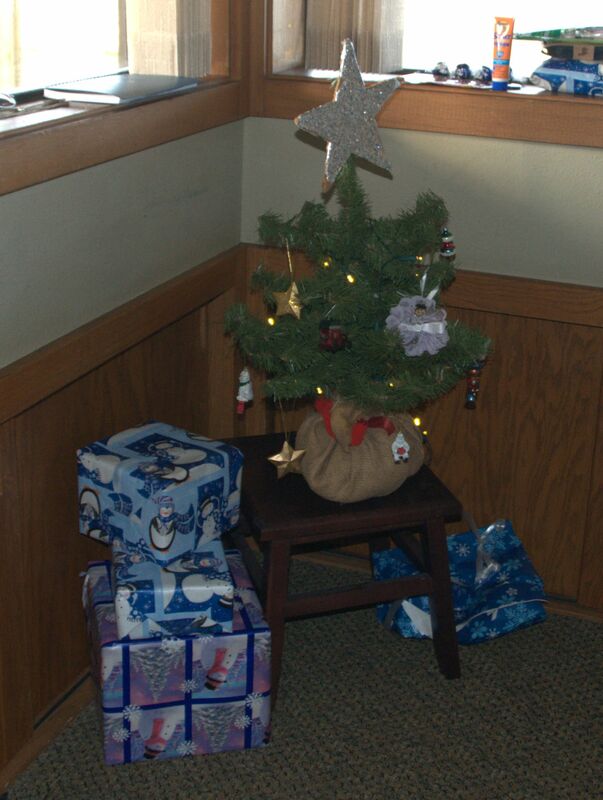 Arno’s little tree that he put up in our room. Hosts Stephanie and Sherwood make the place, however. Yes, it’s beautiful and yes it’s right on the beach and yes it’s a high quality place for a reasonable price. But we did that two years ago in Bend, OR at a different B&B, and it was not the same kind of vacation. This time, when Sherwood and Stephanie greeted us with a cheerful “Welcome Home!” it became obvious they meant for us to feel that way. Listen, I padded up the stairs to breakfast in my socks. That’s how comfortable I was. Another example: We were too tired to drive into town for dinner our first night. Between our own cooler and suggestions from our hosts, we made a delicious little evening meal for ourselves. Even though we were too late for wine hour, they set out a bottle for us before they left for the evening. Arno and I had the entire great room to ourselves, with Christmas music playing and the lights from the tree. It was cozy and romantic and lovely. 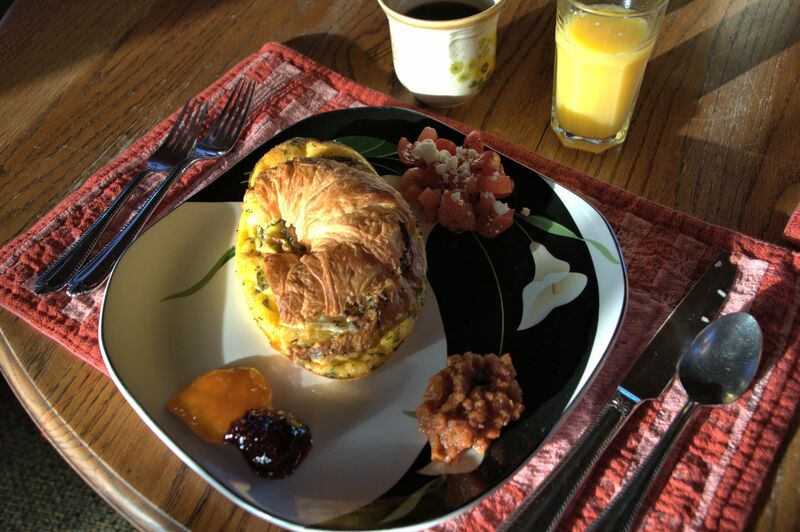 The gourmet breakfasts are above and beyond. Often more than one course, and always plenty to eat. The presentations were so beautiful that one morning a fellow guest commented, “It looks so nice I don’t want to eat it.” But of course she did. 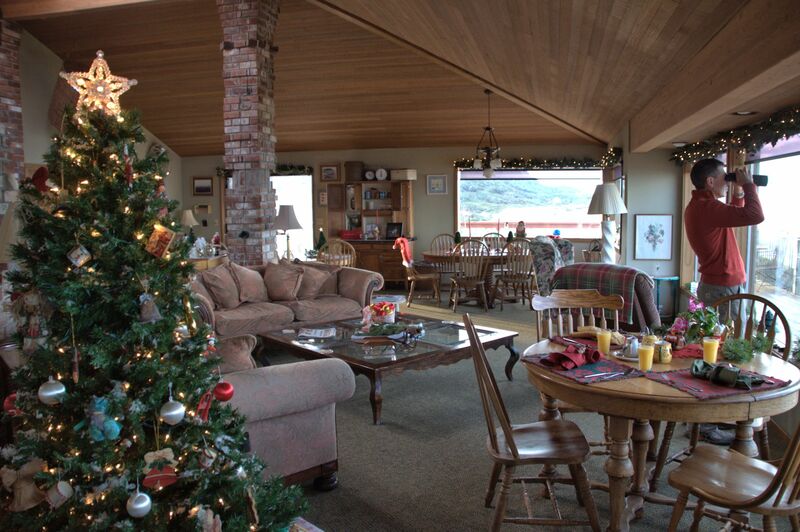 We ate our breakfasts in the huge and welcoming great room on the second floor, with stunning ocean views, a giant fireplace (with stockings hung! 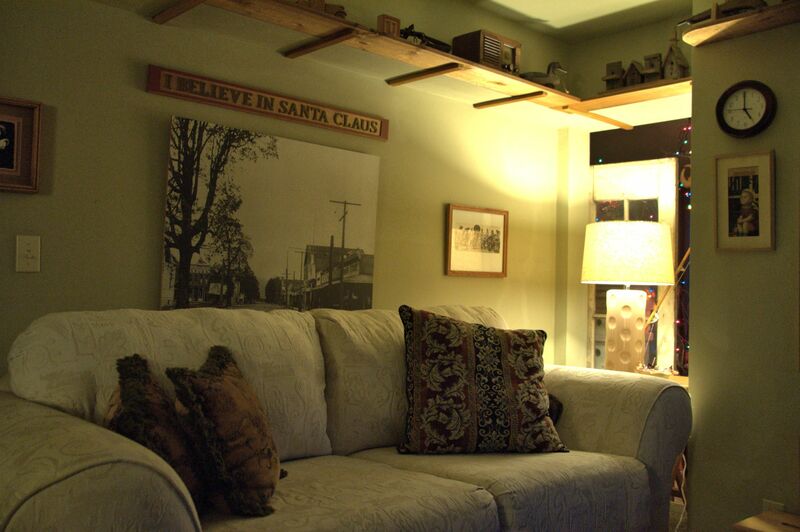 ), couches and chairs and everything else someone could want in there, to include a piano and a Christmas tree. 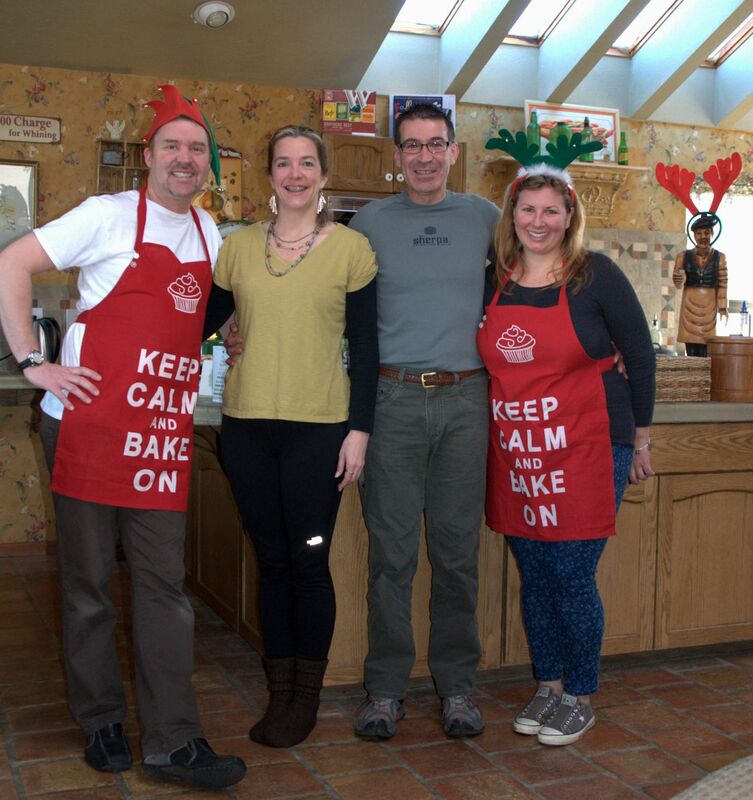 It’s beside an enormous kitchen that is open to the great room, so we could chat with Sherwood and Stephanie while they prepared food. Cozy book room beside the guest kitchen. Even the guests were part of the appeal this year. I can’t help but compare it to other B&Bs I have visited, where the guests hesitate to open up, or even to show up. You may also know that my nature is to avoid social situations (I know I don’t show it, but I’m a good faker), and being around people is often very stressful for me. But there was something here that made me relax. I looked forward to gathering for breakfast or the evening wine hour. We met the most interesting people with great personal stories. The most exciting story of all was finding out that one of the guests knew about the products Arno’s company builds. It’s a small company, so most people, even local people, have never heard of it. The guest was prior Navy and had served aboard a ship that used the UAVs built in Hood River, Oregon. How cool is that? Taken during our gorgeous Christmas morning on the beach. After breakfast we headed back out to play in the tidepools. 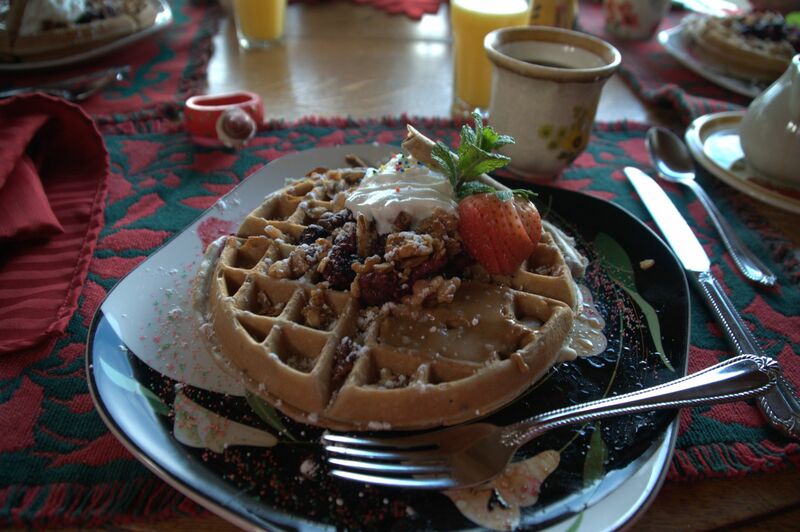 Belgian waffle with walnuts and strawberries and cookie butter. Dinner reservations in town were a breeze because the hosts had thought of it ahead of time, suggested reservation times, and made the reservations for us. They graciously called and canceled for us one night too, when our sight-seeing kept us too far away to make it back on time. Baked egg croissant with fresh tomatoes and feta, salsa, and jams. Eve evening. Stephanie was excited to have prepared all kinds of seafood hors d’oeuvres. The place was decked out to the max in holiday decorations that really added a feeling of festivity for me, particularly since I didn’t decorate at home this year.